Gone are the days that require chopping wood and burning logs to start a fire. With the Dimplex 23-Inch Standard Electric Fireplace Insert, you can skip all the hard work and immediately enjoy a realistic fire with or without heat at the simple press of a button. The Dimplex DFI2309 features a quiet heater fan and 2 heat levels for supplemental heat up to 400 square feet. Designed to mimic a real fireplace, these hand-finished logs are molded after real wood. The realistic logs are handcrafted and are designed after real bark from fire logs. 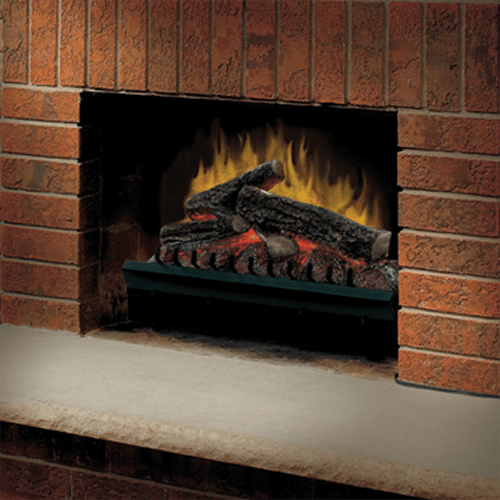 The Dimplex 23-inch Electric Fireplace Insert provides incredible realism with its patented electric flame technology. Dimplex electric fireplaces offer the movement of a real burning fire to achieve a 3-dimensional flickering flame effect. The electric firebox contains two 60-watt light bulbs underneath the log set that generate the pulsing ember bed and firelight flicker for the illusion of an authentic wood fire. The Dimplex 23-Inch Standard Electric Fireplace Insert can function as a supplemental heater, reducing your heating costs to just pennies a day. You can also operate the electric flame without heat, creating a cozy atmosphere and adding to your home’s appeal with flame-onlyoperation. Three manual operating switches — a main on/off switch, a low heat on/off switch, and a high heat on/off switch — are located on the top right corner of the electric heater’s outer frame for easy accessibility. Electric fireplaces are not only a hassle-free solution for enhancing your home décor; they are also harmless to your health and the environment. Dimplex electric logs provide warmth without the negative side effects. Fits Most Fireplaces: This fireplace insert is designed to easily fit just about any size brick- or steel-lined existing fireplace. Quick Installation: Simply center the insert into your existing fireplace and plug into a nearby outlet. Remote Control: An ON/OFF remote, which can also be used on other household electrical devices such as your TV, stereo, or lamp, controls your Dimplex electric fireplace insert from as far as 50 feet away. Overheat Protection: An internal safety device will automatically shut the heater fan off and will not resume operation until the power is manually reset. Low Maintenance: The only upkeep this Dimplex heater requires is lightly cleaning the glass surface with a dry cloth and periodically replacing the two light bulbs whenever you notice a dark section of the flame. Non-Heat Option: Operate with heat during cold winter months or with flame only for an inviting ambiance minus the heat.